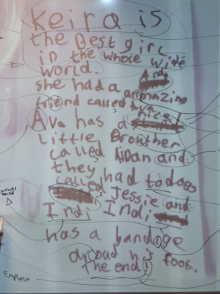 A2 English Language students are working through a unit which focuses on how children learn to write, from first making marks on a sheet of paper to writing a whole text – something our students know as extended writing. This unit forms a key aspect of their terminal exam. Students Peter James and Head Boy Alasdair Smith interrogated a piece of writing collected by Mrs Lea from her daughter’s sleepover at the weekend. From the sample – and data in the exam can be derived from a variety of sources and contexts – Peter and Alasdair correctly identified the Consolidation Phase of writing, the girl’s use of ascenders and descenders (lower case letters which naturally fall above and below the line on a sheet of paper), evidence of self-correction, use of upper casing, consistency of tense, evidence of having been influenced by different writing genres and her level of spelling proficiency, to name but a few. This is more challenging and sophisticated than it looks: students need to be able to demonstrate a confident understanding of the three Assessment Objectives and accurately credit studies carried out by linguists and language theorists. Having been informed that the friend of Mrs Lea’s daughter is six years eleven months and that the writing was produced outside a classroom context meant that they were able to draw highly accurate conclusions about her literacy levels. Whilst it is relatively easy to identify a mistake made in a piece of writing, the A2 English Language group recognise that the childrens’ writing samples they access are showing progress towards a particular phase. The group may have been small this morning, however the annotations, dialogue between the boys and ability to confidently assess the overall success of the writing were most impressive.